Do you still get misty eyed when you go back and listen to Hidden in Plain View's Life in Dreaming? Are your bedroom’s walls covered in posters of the large flux of bands feeding off of emotionally raging lyrics and semi-similar production from the early 00’s? 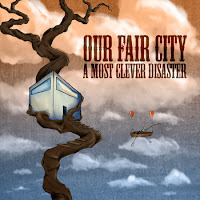 Well history repeats itself, and Our Fair City's debut A Most Clever Disaster will have those looking at the past decade with a smile pleasantly satiated. If you're looking for something new and attention-grabbing however, Our Fair City's first venture may not be your speed. There's something to be said for not needing spotless production and a completely unique approach to your sound, but the combination of the fuzzy guitar discharge of the band's energetic moments and noticeable need for something that doesn't reek of the past ten years clouds over some of the more impressive gems on the album. Any time the band attempts to barrage the listener with a sped up sound, the production of the guitars blends into itself to the point that the audience will be waiting for the quieter moments with impatience. That ends up being more of a compliment than a critique however, as Our Fair City finds their sound at its strongest when vocally focused and instrumentally quieter. That's not me asking for a full album of instrumental tracks from Our Fair City, that's just recognition of the strength within the more ambient moments of their musicianship. Rather than harp on the fuzzy production or the overly familiar sounds, it's much easier to avert one’s ears and focus on the satisfying crooning heard on "Keep Your Hands From Shaking." Lyrically Our Fair City hits the level of abstraction necessary to let the vocals pull their own weight in tugging the emotion from the meaning. Belting out lines such as, "they used to be mothers/ and they used to be fathers/ they used/to be husbands and wives/but tonight they're just people/breathing in tones," doesn't win them lyrical prowess points, but it sounds damn good to hear it cried out over simplistic, earnest instrumentation. The tragedy of Our Fair City being lost in selective memory of recent years is that there truly is a lot to love about A Most Clever Disaster. The emotions in the vocal harmonies feel honest, and when they decide to quiet down like the predominately acoustic "Man's Great Golden Lie," their sound shines bright. Unfortunately, the luster would be so much brighter if this release was dated five years earlier. Don't count Our Fair City out as a product of a lost sound though; there is more than enough to love within A Most Clever Disaster to keep interested listeners intertwined for a few listens. As someone who has thoroughly enjoyed the potential within the package of A Most Clever Disaster, I hope Our Fair City looks forward with their stronger and more individualistic tracks like the instrumental "Burning Your Bridges At Both Ends" or the appropriately titled and pleasantly buoyant "We've Got Clouds to See" and find progress in their future. Stream/Download it for free here.